Author: Herrmann Jungraithmayr, Wilhelm J.G. Möhlig, Anne Storch. Series edited by: Wilhelm J.G. Möhlig, Bernd Heine. This Audio-CD presents an extensive stock of dialogues concerning the daily life of Hausa people as well as text examples from different literary genres, such as fairy tales, narratives, poems, proverbs, and song texts. 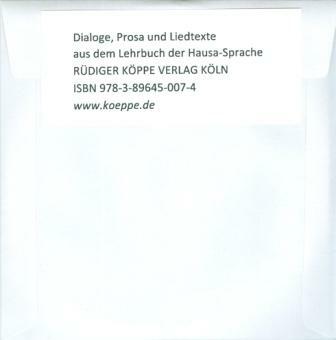 All examples are taken from the manual Lehrbuch der Hausa-Sprache. Ein Grundkurs in 30 Lektionen by Herrmann Jungraithmayr, Wilhelm J.G. Möhlig, and Anne Storch and follow strictly the 30 lessons provided there. The speech samples are spoken by Nigerian native speakers. This Audio-CD is primarily meant for teaching in classes but is also applicable as a practical guidance to train a private learner’s listening and speaking skills apart from university classes. Please find some sample files of the Audio-CD below.